UK's largest range of new jukeboxes. Visit our showroom to audition them yourself. Finance available. All with Free Delivery & Installation. We stock a great range of new jukeboxes, made by some of the most talented craftsmen in the world. These fantastic machines produce unrivalled sound and are icons of the music industry. During the 1940s and 50s, sales of jukeboxes boomed due to the musical revolution that was Rock and Roll. These machines began to spring up in every bar, club and cafe to bring in the young audiences who craved this new sound. 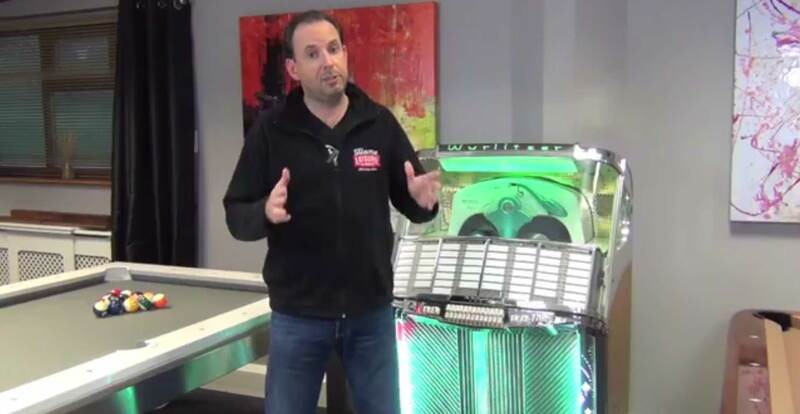 Jukebox designs became more and more varied to attract this new market of Rock and Roll enthusiasts and developed into the iconic designs we recognise today. Jukeboxes today are increasing in popularity, with a great demand for high quality sound systems with unique and vintage looking designs. We stock new jukeboxes from Sound Leisure, Rock-Ola and Wurlitzer, just to name a few. Our new jukeboxes are expertly made to look like the classic designs of the 1940s and 50s. This wide selection of exciting new jukeboxes is really popular and perfect if you love the look of the original classic jukeboxes, but want to play CDs, connect your iPod, or upload songs digitally. These beautifully made machines replicate designs of the most popular models of the silver age, such as the famed Wurlitzer 1015 from 1946 and the Classic 2000 a decade later. They have been expertly crafted to look like classic models and to reproduce the rich tone of the originals too. With the aid of commercial standard components and 300 watt amplifier outputs, these machines are set up to produce deep bass tones and clear treble. These impressive machines are perfect for use both at home and commercially as they are easy to use and so reliable that they will run all day and night with no problems. They have freeplay or coin mechanism capabilities and a range of customisable options, such as lighting, style, colour, finishing, graphics and connectivity. Our CD jukeboxes are a great alternative to vinyl jukeboxes, as most of us have a readily available CD collection. The selection mechanism on these modern replicas help to make the jukeboxes look more authentic; a part of the joy of the originals was being able to watch the machine select and pick up your record before beginning to play it. Some models can be specified to have an iPod dock, which enables you to listen to your complete music collection through an iPod or iPhone, or for friends and family to play their music without you having to remove your CD collection. Take a look at some captivating models in the flesh at our showroom in Bristol and speak to our friendly staff who are specialists in our jukebox range and can advise which models would be best for you.